Know why parking on campus is what it is. Permit price is based almost entirely on the cost of new deck construction and replacing flat lots with decks. It’s expensive to design, build and maintain new parking decks needed for a growing campus. 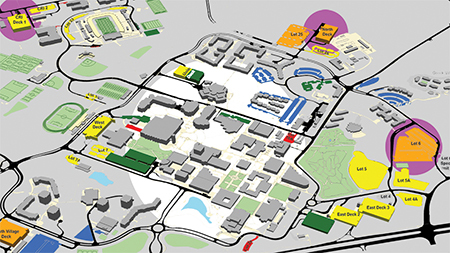 Existing surface lots make way for new buildings and residence halls; those parking spaces must be replaced with decks, as outlined in the UNC Charlotte Master Plan. Decks are far better use of land, but they cost a lot more to erect and maintain. construction of a new PaTS office (due to having to vacate the current facility to make way for the new Science Building). The funds for these projects came from reserves that must be replenished to be able to keep pace with University growth. The last time permit rates increased was 2013-2014, when prices rose 8 percent. This year’s 3 percent increase, approved by the Board of Trustees, changes the cost of a regular, annual permit from $450 to $465. For more information, please review the permit types and price list on the PaTS website. Decks cost about 3 times more than surface spaces to maintain. Will permit prices keep going up? Cost of infrastructure: emergency blue lights, utility lines, etc. If these were the only factors considered, rates would actually be much higher. The financial impact on students, faculty and staff is taken into account, too. Prices are kept as low as fiscal responsibility will allow and the good news is, after several years of ± 8% annual price increases, there has been no increase in permit prices for the past four years. If permits were sold on a one-decal-to-one-space system, thousands of students and staff would be denied the privilege to park while lots and decks would be half empty much of the time. That’s because the majority of commuter students occupy a space for less than 6 hours. Not everyone has classes or works here every day. Spaces turn over constantly in this environment. The current formula for permits sold in relation to spaces available is working, at least for now. There is adequate parking available, all the time. Space verification counts — conducted regularly and often — consistently prove this. Here's a brief video with tips on campus parking and how to prepare for time when parking is at peak demand. Where does the money from citation fines go? PaTS and the University do not financially benefit from citation fines. There are State statutes governing our parking fines (GS 115C-457.1-3, page 305). Basically, the law says that civil fines (i.e., your parking ticket), minus the cost of collection, have to be remitted to the State; then the State allocates the money to local public schools (not colleges and universities). The cost of collection is capped at 20%. Enforcement and collection costs University more than the amount we’re permitted to keep. We often hear this (from upperclassmen). Some schools don’t allow freshmen to park on campus at all, or assign available parking based on class status. At UNC Charlotte, everyone who buys a permit is able to park and the price is the same for students and faculty and staff. Parking availability does get tight, especially in areas closest to the academic core, but there is enough parking for everyone. As long as that holds true, depriving permits to any one segment of the population is unjustified. East Decks, Union Deck, West Deck and the lots closest to them fill up quickly and early (by 8:45 AM). Be prepared! Keep a parking map with you so you can know in advance where there is alternative parking suitable for your type permit. Don’t keep circling full areas! Make another plan and move on. Park in areas toward the edges of campus and take a Niner Transit bus to where you are going. Lesser used areas include North Deck, CRI Deck and the lower level of Lot 6 (on Cameron Boulevard near Campus Edge Apartments). Even at peak class times during the crazily busy first few days of classes, there has always been plenty of parking available in North and CRI decks. Niner Transit buses pick up in all those spots. While it feels counterintutive to park across campus from your destination, It actually takes less time to park farther and take a bus into the academic core than it does to circle a full deck in hopes a space comes open. PaTS welcomes your questions, comments and suggestions: unccpark@uncc.edu.